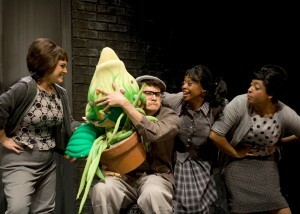 Cygnet Theatre announced today it is extending the run of Little Shop of Horrors through October 2nd. The musical, based on a 1960 low budget, B-horror film by the same name, has garnered rave reviews and packed houses since its July 28th debut at the Old Town Theatre. If you haven’t experienced a performance at Cygnet, Little Shop of Horrors is the perfect introduction to this San Diego gem. My husband surprised me with tickets to Cygnet’s previous production (Our Town, my all-time favorite play). I was amazed by the incredible home-grown talent on display. From set-design to the performances themselves, the caliber of a Cygnet production is spectacular and makes for a more enriching night than one spent at home on the couch. I highly recommend it! Tickets can be purchased by visiting Cygnet’s website at www.cygnettheatre.com or by calling the box office at 619-337-1525.